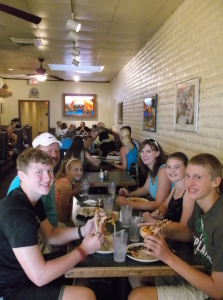 Everybody loves delicious Italian food; and everybody who comes through Page loves Strombolli’s! Jenette Tsosie-Dugi has been stoking the ovens for over 33 years. 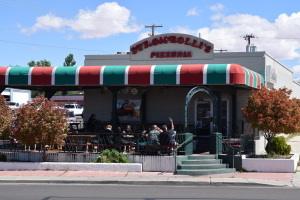 Strombolli’s has fantastic ambiance, and offers perfect indoor and outdoor shaded dining. If you hear a local saying something about “Calzones as big as your head!” they’re talking about Strombolli’s and they’re not exaggerating! There’s no question; Strombolli’s is where you want to go for Italian food in Page. From a filling Soup, Salad, and Bread to a Lasagna Primavera to Linguini with fresh Basil Pesto, Strombolli’s has got your lunch covered in the most delicious way. Baked Cheese Ravioli, Spaghetti, Manicotti, and more! Not sure what you want? Try The Slice, a local favorite; an oversized 2-topping slice of pizza, made fresh to order, just for you! There’s nothing quite like a stone-baked, hand-tossed pizza with fresh sauce and dough, and that’s exactly what you can find at Strombolli’s. They’ve got eight perfect pizza combinations to choose from, including Guido’s Special, Santa Fe, Tuscany, Greek, and La Bianca. Or, if you’re feeling creative, you can choose any combination from their list of 25 different ingredients to make your own custom pizza. All of Strombolli’s extensive menu is available for catering for your special event. Going out on a houseboat? You can call ahead to Strombolli’s special events number, and let them take care of a few days’ worth of meals for your vacation. 928-640-7887. 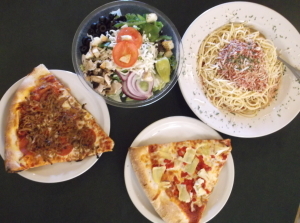 From giant calzones, to salads, to appetizers, pasta specialties, pizza, and much, much more, there is something delicious for everyone waiting at Strombolli’s! Dine in, take out, have delivery, or even have them cater your event or houseboat trip. You can have Strombolli’s fantastic fare wherever you are in Page, which is, as they would say in Italy, ‘Molto Bene’!